Happy fuuuhhh-reaky Friday! It just wouldn't be Friday if I didn't say that, now would it?! In college, I was SUPER spoiled enough to live in a beautiful sorority house on campus. One of the many benefits of this lifestyle is that we had fantastic cooks who made all of our meals for us. Breakfast was actually made to order. I know. While I usually rolled with some scrambled egg whites or an egg white omelette with toast, I always looked forward to the days when our breakfast cook would put out "Monkey Bread." If you are not familiar with Monkey Bread, that may not be such a bad thing. The #1 ingredient in this stuff is sugar & love handles. But...it's incredible. It is this sticky, ooey, gooey, cinnamon baked bread that you actually pull off in chunks. And now I'm craving it. So, I'm not here today to tell you how to make a healthy(ish) version of my old college breakfast treat, because, quite frankly, I don't think that's possible. 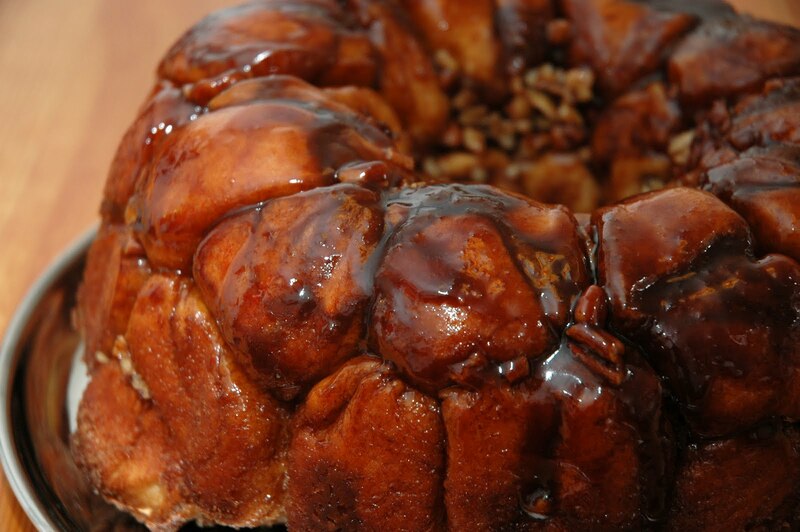 The real monkey bread is a "treat" and it should stay that way, capiche? BaNaNa BrEaD! :) Woo hoo! You all know I love to cook, but if it doesn't come out of a box, I'm not really a "baker." With that said, whenever finals time rolls around, I am always in the mood to whip out my apron and get my betty crocker on. Last semester, I made up these chocolate chip chewy bars (another delicious treat), and the one before that I made about a trunk full of puppy chow. This time around, I was craving something warm, wholesome, and fruity. So, I adapted a recipe I found over on Cooking Light, and got to the kitchen! Step #2: In a large bowl, combine all dry ingredients (flours, grits, sugar, salt, baking powder, baking soda, and cinnamon). Mix with a wooden spoon until combined. Step #3: In a separate bowl, mash up your bananers. If you're one of those people who loves to play with your food (eehhmm...Ashley! ), you will really enjoy this recipe. I left mine a little on the chunky side. Step #4: Make a "well" in the center of your dry mixture in the large bowl (aka just clear a space in the middle). In the "well" add the eggs (previously lightly beaten), oil, vanilla, blueberries, and bananers. Step #5: Stir the mixture all up with your wooden spoon, just until moist. I was a little thrown off by the lack of liquid in this recipe. It really seemed like I should add some milk or something because it was SUPER hard to stir it all up. Do not be fooled, it will work out without any extra liquid. Step #6: Spray an 8 x 4-inch loaf pan with cooking spray (the bottom and the sides) until well-coated. Step #7: Pour your bread mixture into the pan and place it in the oven. Bake for 1 hour or until you can stick a wooden toothpick in the bread and it comes out clean. Step #8: Take the loaf out of the oven, and allow it to cool, in the pan, for 10 minutes. After 10 minutes, carefully remove the loaf from the pan and allow it to cool for another 5 minutes on a wire rack (I turned mine upside down on the rack and it came right out without falling apart!). Once it's cooled, you can slice it up, serve, and enjoy! I had mine this morning with a little natural peanut butter, and a blueberry Chobani on the side. The bread was so filling, I could barely eat any of the yogurt! Mmm mmm good. Give this one a shot for a delcious breakfast treat, or maybe to impress your family and/or friends at an Easter brunch! I hope you all have a fantastic weekend, whether you are celebrating Easter, or just have plans to relax and unwind with some family & friends. My mouth is literally watering at the sight of that banana bread.